what changes are to be done if using the STM32F4 instead? your tutorial is a very good start with CooCox and STM32 Discovery boards. I tried your example with my STM32F4 DISCOVERY and it worked fine. Since I already had a small test code for this board written for Keil uVision4 (evaluation, 32k limited), I tried moving its source files to CooIDE. It compiled fine. 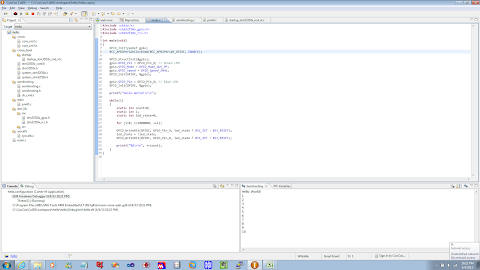 But I noticed that the initialization code in source file system_stm32f4xx.c is not executed. What I care now is setting FLASH->ACR, which I found in system_stm32f4xx.c. "don't use the standard system startup files" is ticked. Am I tampering with the project the wrong way? I would recommend starting from a CooIDE created project started from scratch and merge in your other project a file at a time. Only bring over the .c files. Probably don't bring over the .elf and .o files from the other compiler in case they wouldn't cooperate. Good luck! Some tinkering will be required but you can get it! C:\CooCox\CoIDE>"C:/CooCox/CoIDE/bin\coflash.exe" program STM32F407VG "C:/CooCox/CoIDE/workspace/hello/hello/Debug/bin/hello.elf" --adapter-name=ST-Link --port=SWD --adapter-clk=1000000 --erase=affected --driver="C:/CooCox/CoIDE/flash/STM32F4xx_1024.elf"
I am a first time user. Please could you help. Thanks. 3. When the upgrad is over, Restore the setting to "SWD"
The disconnect and reconnect needed plugging the USB plug. Now I have completed your tutorial! Many thanks for your blog. Regards Kevin. Hi benfraj elmokhtar - looks like the output file (stm32f4xx_rcc.o) already exists. Try to do a Project + Clean first, or start from scratch. More help may be available at the CooCox forums. Thanks Dave, this is a great tutorial - it helped me get started. and that you need to add m to the Linked Libraries box in the Link tab in the project configuration - this is to include the maths library for the floor() and round() functions. It is my first experience of programming a µC. I get "Unresolved inclusion: " . I don´t know how to fix it. I installed STM32 ST-LINK Utility on my C-drive but then I moved the whole folder to D-drive to the same folder where I have installed my CooxIDE. Thanks for the tutorial. I had an error that I fixed by modifying core_cm3.c. After that all was good. Unfortunetaly i've got a problem. I Did everything u said and when i right-click on project to select Configuration i CoIDE crashes :< Dunno why. Maybye u know what couses this problem? Sorry, haven't seen that problem. You may want to check with the CoIDE forums. Now i got aanother problem - with compiler. I can't build project, and i found out that I can't set the same toolchain path as here http://www.coocox.com/CoIDE/Compiler_Settings.html after the GCC ARM Embedded installation. What am I doing wrong? Can't help you there. Sorry! Now everything works as expected ! Thanks for taking the time to write this up. It has save me a ton of time. Thanks for the great post. 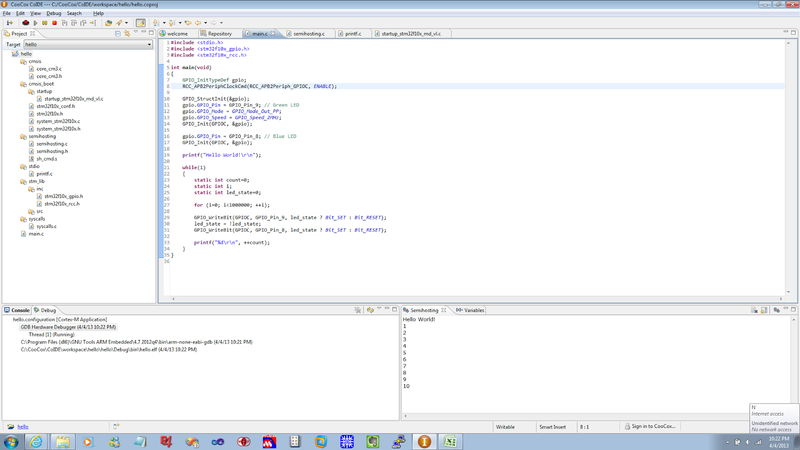 I am using eclipse and tried to utilize semihosting library files with STM32F0Discovery. I enabled semihosting in eclipse and I could build it after minor changes in the code. Everything seems to be fine except SH_DoCommand function defined in SH_cmd.s file. I get "no source for SH_DoCommand()" message during debug process. HAs anybody got it worked in eclipse? This tutorial is very useful and precise. I want to use this CoIDE tool to move projects to Linux using Makefile. Hopeful someday, Coocox will have a Linux port. We need something that good and open source over in Linux world! Thank you very much for "printf" in semihosting !!! Thank you so much for this guide! may i ask regarding this issue im encountering when Im using the LCD drivers? I have already have the xhw_types.h in the projects but still getting this error. Sorry Patrick, I am not familiar with that type and error. i tried this code for blinking led. But it didn't work. Can you help me. i share tihs code. When you want to flash an LED in a loop, you usually need to have code that turns the LED off, turns the LED on, and delays in between each change. I only see one of these three in your code. Review my original code again that has these elements. thanks for the excellent tutorial dave ant it helped me a lot. i do not get anything printed when in debugging. please help. Ran through the demo again today, almost 3 years later. Note that to enable Semihosting, the Debugger tab is within the Configuration View while not running. That is where you have to click on "Semihosting Enable" before printf will be redirected to the Semihosting window. Also it was necessary to upgrade the firmware on the STM32F4DISCOVERY board using the ST-Link Desktop application. Hello, I need to make "snake game" in 8x8 matrix display and using STM32F407VG.Its very important for my graduation.Is there anyone who can help me?